Pi is a mathematical constant whose value is the ratio of any circle's circumference to its diameter in Euclidean space; this is the same value as the ratio of a circle's area to the square of its radius. It is approximately equal to 3.14159265 in the usual decimal notation. Many formulae from mathematics, science, and engineering involve ¹, which makes it one of the most important mathematical constants. 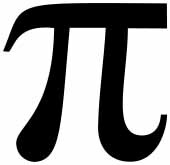 Pi is an irrational number, which means that its value cannot be expressed exactly as a fraction m/n, where m and n are integers. Consequently, its decimal representation never ends or repeats. It is also a transcendental number, which implies, among other things, that no finite sequence of algebraic operations on integers (powers, roots, sums, etc.) can be equal to its value; proving this was a late achievement in mathematical history and a significant result of 19th century German mathematics. Throughout the history of mathematics, there has been much effort to determine ¹ more accurately and to understand its nature; fascination with the number has even carried over into non-mathematical culture. Probably because of the simplicity of its definition, the concept of ¹ has become entrenched in popular culture to a degree far greater than almost any other mathematical construct. It is, perhaps, the most common ground between mathematicians and non-mathematicians.Reports on the latest, most-precise calculation of Pi (and related stunts) are common news items. The current record for the decimal expansion of ¹, if verified, stands at 5 trillion digits. The Greek letter ¹, often spelled out pi in text, was first adopted for the number as an abbreviation of the Greek word for perimeter (as an abbreviation for "perimeter/diameter") by William Jones in 1706. The constant is also known as Archimedes' Constant, after Archimedes of Syracuse, although this name is uncommon in modern English-speaking contexts.